Daniel Tudor has lived in Seoul for many years and served as Korea Correspondent for The Economist from 2010 – 2013. His first book Korea: The Impossible Country received strong praise and has been translated into many languages. His subsequent book, North Korea Confidential (with James Pearson), was selected by The Economist as one of the best books of 2015. 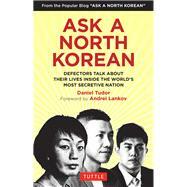 Andrei Lankov is a Director at NK News and writes exclusively for the site as one of the world's leading authorities on North Korea. A graduate of Leningrad State University, he attended Pyongyang's Kim Il Sung University from 1984-5. In addition to his writing, he is also a Professor at Kookmin University.